The mayoral election has been dominating headlines in recent weeks in the City of Boston, but campaigning for the candidates has been going on for much longer. Several students at Boston University have gotten involved with mayoral candidates Martin Walsh and Tito Jackson’s campaigns and are using their voice to influence local politics — even if Boston is only a temporary home. Between five and eight BU students have been involved in Walsh’s re-election campaign, according to Walsh campaign spokeswoman Gabrielle Farrell. Representatives from Jackson’s campaign did not respond to requests for comment — but one BU student involved in the campaign said about four BU students worked for Jackson. Farrell said BU students have participated in the communications aspect of the campaign, which involves talking to residents and sharing their experiences through various digital media, as well as field operations by knocking on constituents’ doors and phone banking. “It’s really been a huge effort of outdoor canvassing, making sure that the mayor’s track record is well-known and that we really pick a large group of people who are invested in the mayor’s vision to make that happen, and the students have been a huge part of that,” Farrell said. Dean of Students Kenneth Elmore said he encourages BU students to register to vote in Massachusetts and get involved in local politics, as Boston is their home now. Elmore said he’s happy to see BU students engaging with local politics. Sam Kubota, a senior in the School of Education, wrote in a Facebook message that she volunteered for Jackson’s mayoral campaign after being inspired by his visit to one of the civics classes she taught through BU’s Generation Citizen program. Kubota wrote that when Jackson took the time out of his schedule to engage with students — many of whom are not registered voters — and tell them why their beliefs matter, she began to admire his authentic care for his constituents. 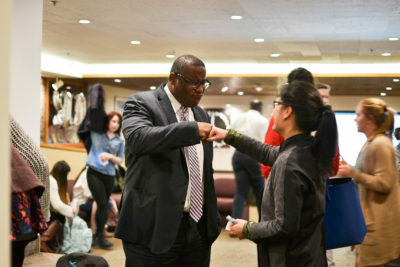 “Seeing the kinds of connections Tito is able to make with my students, [the] majority of whom are students of color, emphasized the importance of seeing people who look like you in high-status positions,” Kubota wrote. Another Jackson campaigner, Asia Gordon, said she became involved with Tito’s campaign as a student in the Educated Electorate writing class, which requires students to volunteer for a political campaign for four weeks. Gordon, a sophomore in the College of Communication, wrote that she was inspired by Jackson’s willingness to speak to her small class and educate them on his vision for the City of Boston. Arber Pellumbi, a junior in the College of Arts and Sciences and a press fellow for Walsh’s campaign, said becoming involved in the mayor’s campaign was one of the best decisions he made this semester because it allowed him to see politics in action. Similarly, junior Sam Nelson, a press intern for Walsh, wrote that it’s vital for college students in Boston to use their voice to influence local politics. Nelson explained how her involvement in Walsh’s campaign has been educational and rewarding. Another press fellow for Walsh, Devin Harvin, said he became involved in Walsh’s re-election campaign to engage in politics on a local level with a politician whom he had a lot of respect for. Harvin, a CAS senior, added that his experience with the campaign allowed him to see what kind of impact he could make on Boston residents.